The day kicked off with a massive yoga demonstration at Rajpath with Prime Minister Modi calling it 'Yogpath'. Across India, the celebrations echoed as bad weather refused to dampen the spirits of yoga practitioners. The Hindu presents day-long coverage to this event from across the country and select foreign nations. 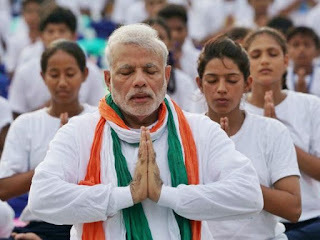 10:22 am: Maharashtra Chief Minister Devendra Fadnavis praised Prime Minister Narendra Modi for giving an international status to yoga and said it should be kept away from religion and politics. 10:15 am An open field at a local university in Thailand turned into a “yoga studio” early today as thousands of Thais, Indians and other expatriates gathered here to celebrate the first International Yoga Day.